All Creatures Great and Small, the television show, was produced in two segments; first in between 1978-1980. Two longer specials followed in 1983 & 1985. Then the series started again in 1988 and kept going until 1990. One last special followed on Christmas Eve in 1990. In 1937, a young, newly-qualified surgeon arrives in the picturesque village of Darrowby to take up his first job in the established veterinary practice of Sigfried and Tristan Farnon. But in rural Yorkshire, with few medicines available, the treatment of sick animals still seems to be rooted in the Dark Ages. 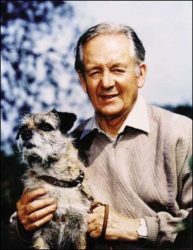 This, together with the country-folk’s inherent suspicion of strangers, poses problems for James Herriot in the early years of his career. Gradually, James establishes himself with the people of Darrowby and is made a partner in the veterinary practice. He courts and eventually marries Helen and becomes a family man. And over the next 20 years, James, his family and friends share in the joys and heartaches of caring for the many wonderful creatures that become part of their world. Based on the best-selling novels by James Herriot. All Creatures Great and Small: The Complete Collections is currently available from Amazon.com. *Number in parentheses at end of program description is BBCWA library tape number. Date is the original air date on BBC One. James has been mustered out of the army at war’s end and returns to the Yorkshire Dales. He, Siegfried and Tristan are soon about the day to day dramas of a rural veterinary practice once again. James, Helen, Siegfried and Tristan find themselves in the constant of change that is life in England immediately after World War Two. Tristan and Biggins battle for a place on the the team to ring the Christmas peal.